A serious or life-threatening emergency can be an unexpected and stressful experience. We begin care from the minute you call 9-1-1. Our goal is to provide a coordinated, professional and timely response to your emergency. In Contra Costa, an emergency medical response is provided by a network of first-rate agencies. The Emergency Medical Services Division of Contra Costa Health Services works with these partners to ensure everyone involved in an emergency response is specially trained and properly equipped. To ensure that quality emergency medical services are available for all people in Contra Costa County, and that emergency medical care is provided in a coordinated, professional and timely manner. Planning, implementing, and evaluating emergency medical services. Monitoring and approving EMT-I (Emergency Medical Technician), paramedic, and Mobile Intensive Care Nurse (MICN) training programs. Conducting credentialing programs for EMT-Is, paramedics and MICNs. Authorizing advanced life support (ALS) programs. Establishing policies and procedures for EMS system medical control, including those for dispatch, patient destination, patient care, and quality improvement. Establishing ordinances and/or exclusive operating areas for regulation of ambulance services. Approving and monitoring Prehospital Continuing Education Providers. Developing and implementing a trauma system and other specialty system programs. Conducting an impact evaluation when notified that an acute care hospital plans to downgrade or cease providing emergency medical services. Implementing EMS program enhancements funded by County Service Area EM-1 (Measure H). Tracking and monitoring hospital emergency and critical care capacity. Procuring and monitoring emergency ambulance services countywide. Planning for and coordinating disaster medical response at local and regional levels. Implementing and monitoring an Emergency Medical Services for Children Program countywide. To accomplish these functions, the EMS Agency employees adequate staff including an EMS director, EMS medical director, EMS assistant director, Health Services disaster preparedness manager, RN or paramedic prehospital care coordinators, and administrative support staff. Increased numbers of paramedic ambulance units available to respond to 9-1-1 calls. A countywide firefighter first responder defibrillation program including automated external defibrillators purchased and maintained for all fire response units. Fire first responder advanced life support paramedic services. First responder training, equipment, and supplies. Medical supply caches purchased and maintained for multicasualty/disaster response. An upgrade to the MEDARS radio system used for ambulance-to-hospital communications. Radios for ambulances to communicate with fire first responders. 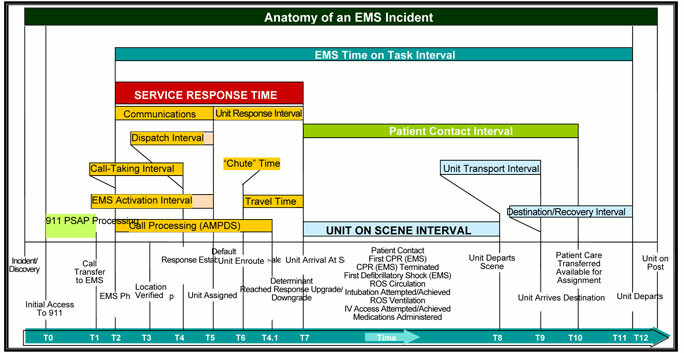 An upgraded ambulance dispatch system and dispatcher preparedness. Enhanced response to hazardous materials incidents. Upgrades to fire dispatch and alerting systems to provide faster and more reliable fire dispatch for all calls. An electronic patient care record system for use by fire paramedic units. EMS services are typically provided in response to a medical emergency reported through the 9-1-1 emergency telephone system. A 9-1-1 call placed from any telephone is automatically routed to the appropriate designated primary Public Safety Answering Point (PSAP) usually located at the dispatch center for the law enforcement agency in whose jurisdiction the 9-1-1 call is placed. (Calls placed from cell phones are generally initially routed to a California Highway Patrol (CHP) dispatch center, although new technology when fully implemented will enable most 9-1-1 cell phone calls to be routed to the appropriate local law enforcement PSAP.) At the PSAP, whether local or CHP, a complaint operator determines the nature of the emergency and, transfers medical emergencies to the appropriate fire/medical dispatch center. In some cases, Richmond for example in Contra Costa County, primary PSAP and fire/medical dispatch center are part of the same facility. A dispatcher at the fire/medical dispatch center obtains details of the caller's medical emergency and initiates dispatch of appropriate EMS resources. The three fire/medical dispatch centers include the San Ramon Valley Fire Communications Center, which dispatches fire and ambulances units within that jurisdiction, the Richmond Police Communications Center, which dispatches fire units in Richmond and El Cerrito, and the Contra Costa County Fire Communications Center, which dispatches fire units throughout the rest of the county and dispatches ambulance units operated by Moraga-Orinda Fire. Dispatchers at each fire/medical dispatch center are trained in Emergency Medical Dispatch and are able to provide instructions to assist a caller in providing first aid or CPR while EMS responders are en route. Each of the three fire/medical dispatch centers employs standard algorithms (ProQA) for interrogating 9-1-1 callers, assigning appropriate response resources and priorities, and providing over-the-telephone first aid instructions. The Ambulance Provider Ambulance Dispatch center dispatches ambulance units upon requests received from the Contra Costa Fire or Richmond communication centers. These requests are handled through a seamless CAD-to-CAD linkage known as the EMS Message Transmission Network (MTN). The initial response to a potentially life threatening incident generally includes both a non-transporting fire first responder unit and an emergency ambulance. Most fire fighters are trained and certified as an Emergency Medical Technician I (EMT-I) to provide Basic Life Support (BLS) and, regardless of EMT-I certification, all fire fighters in Contra Costa County are able to provide first aid, CPR and defibrillation. Most fire engines in the County are staffed with at least one paramedic able to initiate Advanced Life Support (ALS) prior to arrival of an ambulance. Crockett-Carquinez Fire, East Contra Costa County Fire, and Richmond Fire provide first responder service at the BLS level only. In areas covered by non-paramedic fire services, the EMS Agency has put in place alternative solutions to assure timely arrival of an ALS-capable responders and the availability of at least two paramedics when needed as the scene of a medical emergency. In areas served by Crockett-Carquinez and by East Contra Costa County Fire, single-paramedic-staffed, non-transporting "Quick Response Vehicles (QRV's)" are operated by AMR to augment the fire BLS first response and paramedic ambulance response. In Richmond, the EMS Agency has set ambulance response time and staffing standards to assure a 10-minute, two-paramedic response on most calls. Emergency ambulance response throughout Contra Costa County is provided by private or fire district ambulance services operating under exclusive operating area (EOA) agreements with the County. San Ramon Valley Fire and Moraga-Orinda Fire provide emergency ambulance services within their respective districts. AMR is the County's emergency ambulance provider covering all other areas of the County. Emergency ambulances are staffed with one paramedic and one EMT-I or with two paramedics depending on the area served. BLS ambulance staffed with two EMT-Is may be used to respond to calls that have been determined through the Emergency Medical Dispatching system not to require paramedic response. Patient treatment and transport are carried out under State and local EMS agency policies and procedures. These policies include, in the case of paramedics, making contact with a mobile intensive care nurse (MICN) or physician at the designated base hospital for medical consultation in patient management according to County EMS treatment guidelines. Patients are transported to hospitals able to provide needed services. Hospital destination is determined based upon patient preference and County EMS protocols. Critical patients may be directed to the nearest emergency department, STEMI Receiving Center, or to the trauma center. Non-critical patients may be transported to hospitals of choice within reasonable travel time. Medical helicopter service is available to transport critical patients when ground ambulance transport time would be excessive. Two medical helicopter services, CALSTAR and REACH, are authorized to respond to local EMS calls on a daily rotation schedule. Both agencies provide advanced life support services and maintain 24-hour helicopter unit availability based at Buchanan Field in Concord. Other helicopter services are available to respond from neighboring counties if both CALSTAR and REACH are unavailable. See EMS Timeline - Decades of EMS Accomplishments.